This afternoon I filled a pan with butternut squash and yams, and left it roasting in the oven while I wandered around the forest; Oli tearing a wild trail ahead of me. Upon our return an hour or so later, the sweet, warm scent of roasting squash welcomed us back into the house. Delicious. And now —with the temperature dropping and sky streaked with magenta and dusty plum— I am about to settle down for a cozy meal. 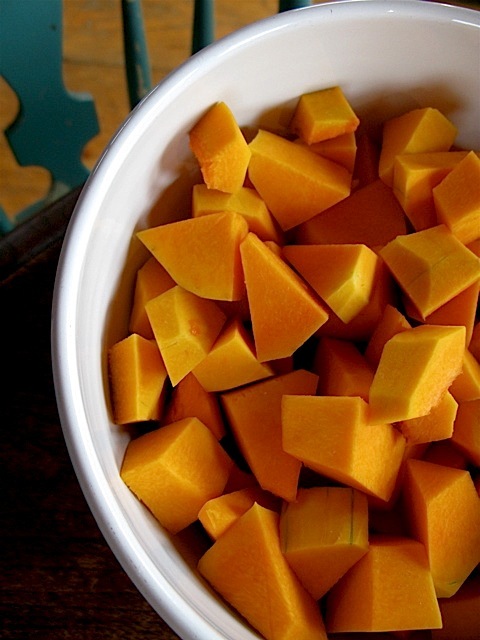 Zucca disfatta is a roasted, hand-mashed and sauteed, sweet squash dish. 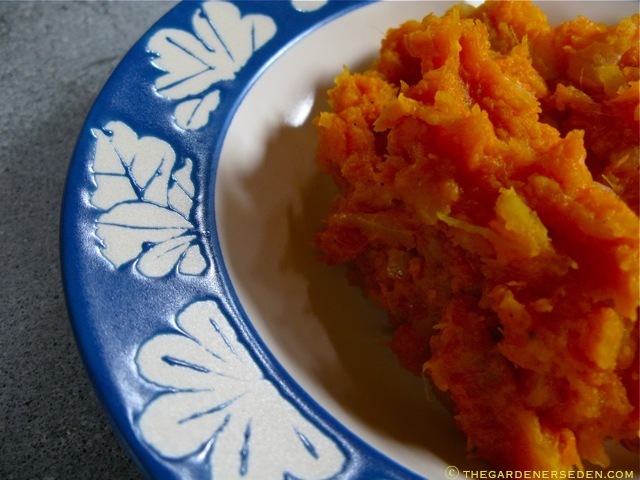 Enjoyed in northern Italy and elsewhere in the cool, mountainous regions of Europe, this recipe is is traditionally served on holidays – but there is no need to reserve it for special occasions. Easy to prepare, this warm and fragrant dish makes a wonderful accompaniment to other autumn favorites (including roast chicken, turkey and pork, for meat-eaters). 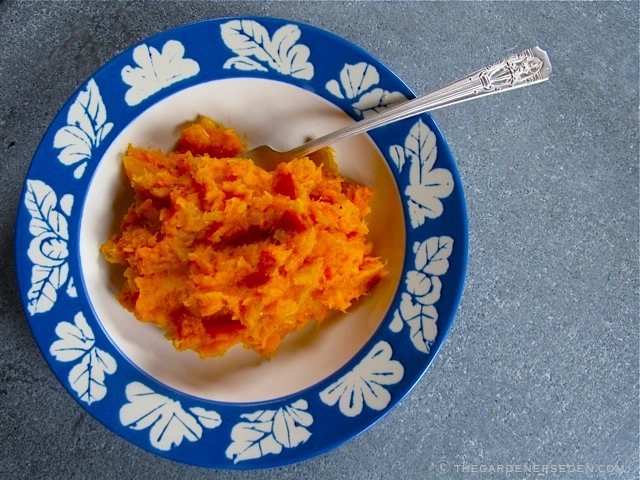 The squash and yams can be roasted and mashed ahead of time, and the sweet flavor also makes delicious filling for ravioli (great use for leftovers!). I have tried many variations on this simple recipe, but the basic directions below (from Lynne Rossetto Kasper’s The Splendid Table) are a good place to start if you have never tried this dish before. Preheat oven to 400 degrees fahrenheit. Line a roasting pan with aluminum foil and drizzle with olive oil. 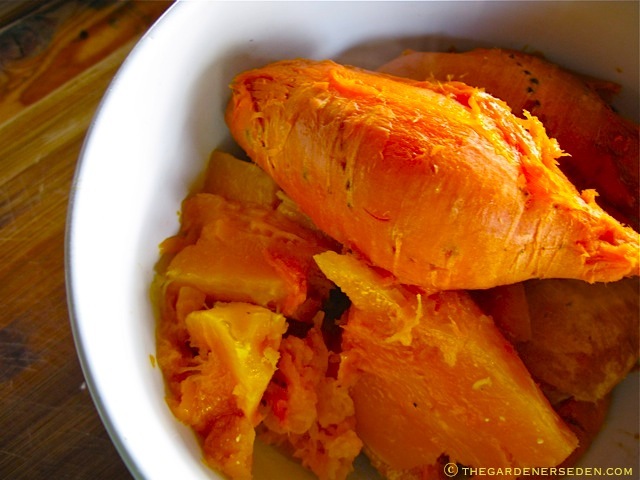 Slice the squash in half vertically, remove the seeds and lay the pieces face down in the roasting pan. 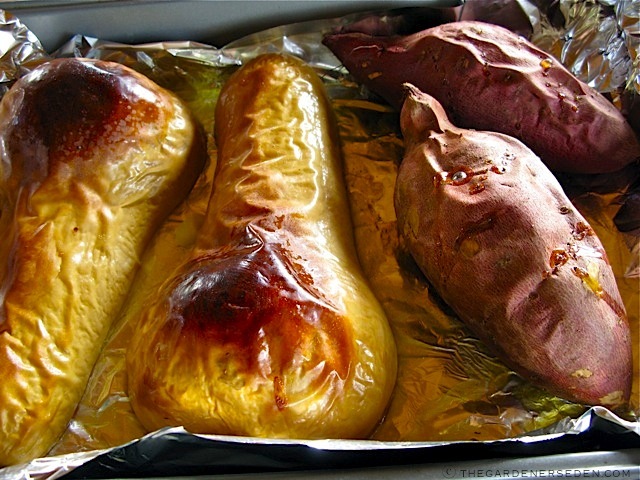 Prick the yams with a fork and settle in the pan beside the squash. Send them into the oven for about an hour, or until soft when pricked with a fork. Remove to cool. 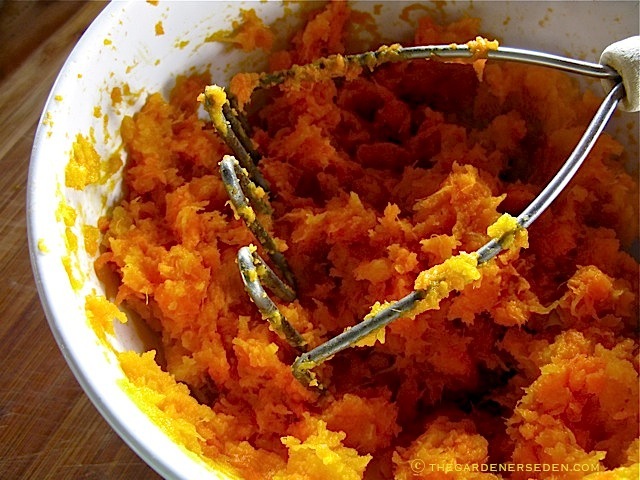 Peel vegetables and mash by hand in a large bowl. Set aside (may be done ahead of time). In a small saucepan, heat the water to a boil and blanch the citrus zest for approximately 3 minutes. Drain in mesh colander and set aside. In a large skillet, heat the olive oil. Add the minced onion and cook for approximately 15 minutes, until golden. 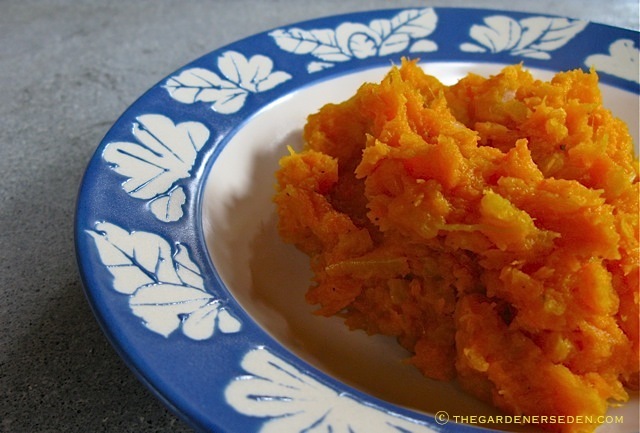 Remove from heat and add to the squash/yam mash. Mix in the cinnamon and citrus zest. Turn the mixture into the skillet and cook slowly, stirring constantly, on medium-low for approximately 15 minutes or until water is evaporated. Add salt and freshly ground black pepper to taste and serve hot. 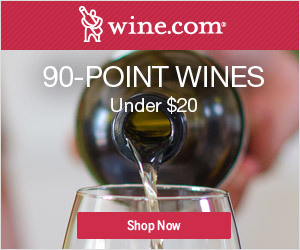 This dish is excellent as a side with roast chicken or turkey, and many other meats. It can also be used as a delicious filling for homemade ravioli. So what am I doing outside these days? Oh all sorts of last minute, before-the-snow-flies chores and holiday decorating. 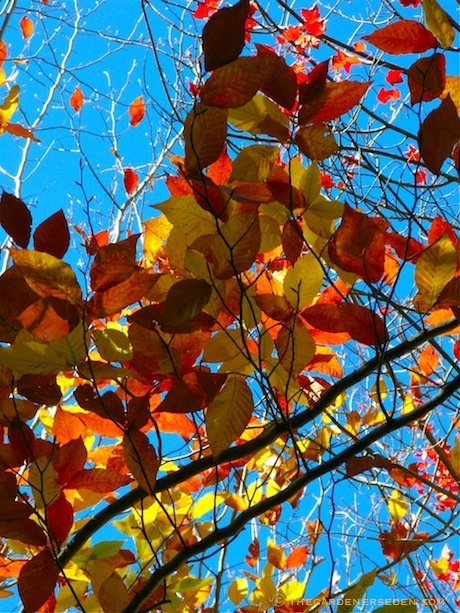 Up until today, it has been unseasonably warm in New England, and I have been delighting in the temperatures while gathering greenery and stringing lights. 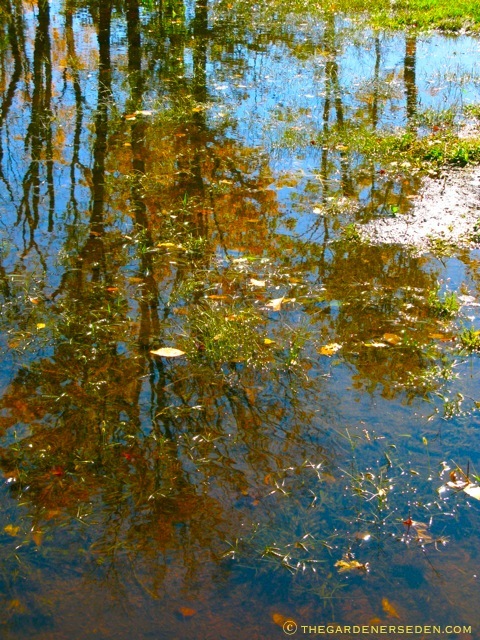 But this morning, the air is a bit nippy, and I still need to wrap and protect some ornamental trees, (more on that later), in my garden. After only an hour outside today, my fingers were already getting cold. I know I will get cranky this afternoon if I don’t make something warm to fill me up later. The wintry clouds are moving in now, promising at least a few inches of snow. I can hardly contain my excitement ! Just imagine how beautiful everything will look in the morning. I sure hope the forecast is accurate, don’t you? Things are looking a bit drab outside these days. A blanket of white will really bring out the red twigs and colorful berries in my garden, and I think the conifers look particularly magical all cloaked in fluffy snow. Speaking of color, I am a push-over for bright orange soup on a grey day. 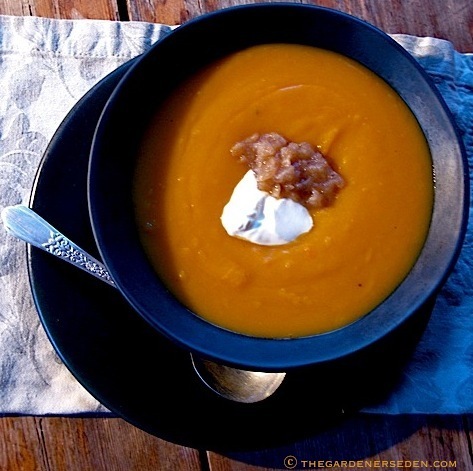 This recipe for fragrant, creamy-textured butternut squash soup delivers exactly the warm temperature and hue I am craving. 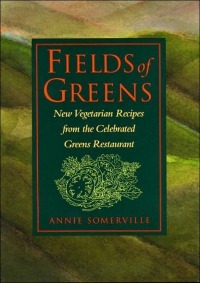 I love Annie Somerville’s Fields of Greens: New Vegetarian Recipes From The Celebrated Greens Restaurant cookbook for many reasons, but this soup recipe is really at the top of the list. I messed with the ingredients just a bit, since I do not have Calvados on hand. But I have found that Zeke’s heirloom apple cider, (from local Scott Farm), is a delightful flavor substitute when combined with a bit of French brandy. Warm the vegetable stock in a pot over low heat. Meanwhile, heat 1 Tbs of olive oil in a medium sized soup pot. Add the sliced onion, 1/2 teaspoon of salt and bit of pepper. With the burner on medium, saute the onions, stirring regularly, for about 15 minutes, or until slightly caramelized. Add a bit of stock and scrape the onions from the bottom of the pan. Add 2 Tbs. of brandy and 1 Tbs apple cider, and cook over medium high heat until the pan is nearly dry. Add the squash and 1 tsp of salt to the pan. Pour about 2 cups of vegetable stock, perhaps slightly more, into the pot until the squash is just covered. 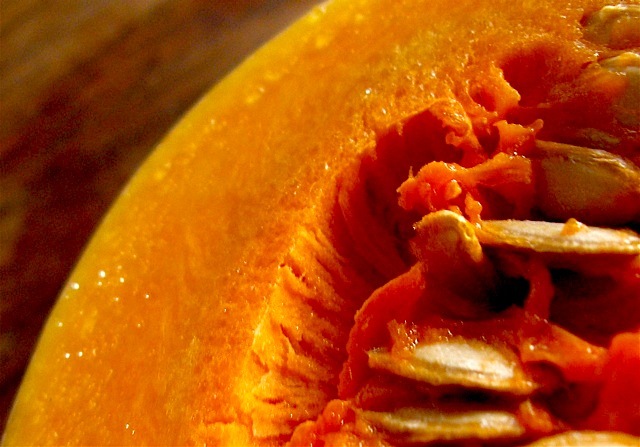 Cover and cook over medium heat for about 20 minutes, or until the squash is soft. Pour the soup into a blender or food processor, add a bit more stock to liquify, and puree to a thick but soupy consistency. Add more stock as needed. Pour the soup back into the pot and simmer for a half an hour over low heat. To make the apple confit: Melt 1 Tbs. butter in a saute pan, (with a lid). When the butter is melted, add apples and saute, medium-high, stirring to coat the apples in butter. Add 1 Tbs. Calvados or Brandy and cook down for about 2 minutes, or until the pan is nearly dry. Add the apple cider and cover, cooking the apples over medium heat for 15 minutes, or until soft. Uncover and cook another 5-10 minutes, reducing the liquid. Mash the apples lightly. Divide the confit in half. Stir one half into the soup and set the rest aside to spoon atop each serving bowl. Add a dollop of creme fraiche and float a bit of apple confit atop each warmed bowl of soup before serving. Swirl for a pretty effect. 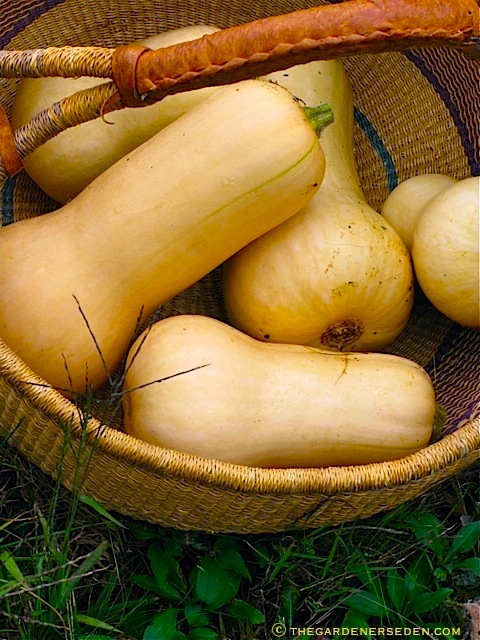 You are currently browsing entries tagged with Butternut Squash recipes at The Gardener's Eden.